Preheat the oven to 425°F and line a baking sheet with foil and nonstick cooking spray, or a large oven safe skillet. Season each fillet with salt and black pepper, to taste. 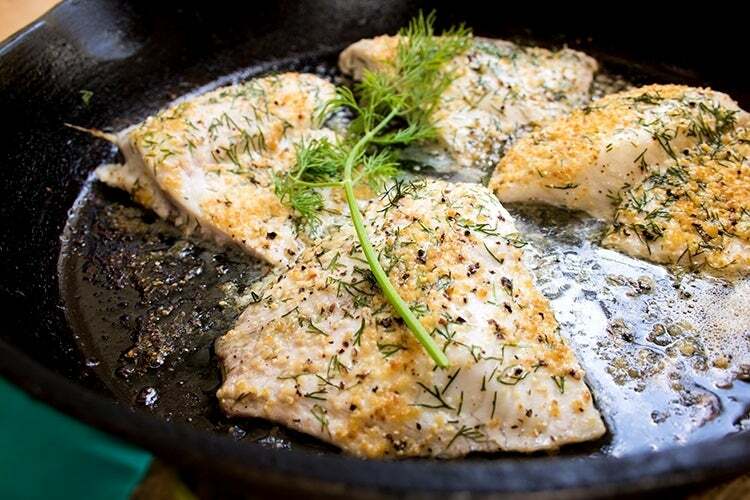 Sprinkle the lemon peel seasoning evenly on each fillet, then brush with the melted butter, squeeze of lemon, and sprinkle 1 tablespoon of the chopped dill over each fillet. Bake for 14-16 minutes, or until the fish is opaque and the flesh flakes easily with a fork. While the fish is baking, make the sauce: In a small microwave safe bowl, soften the cream cheese 30 seconds at a time, until very soft. Stir in the lemon juice, the remaining 1 tablespoon of chopped dill, and lemon zest into the melted cream cheese. Evenly divide the sauce between the 4 fillets, and serve hot.